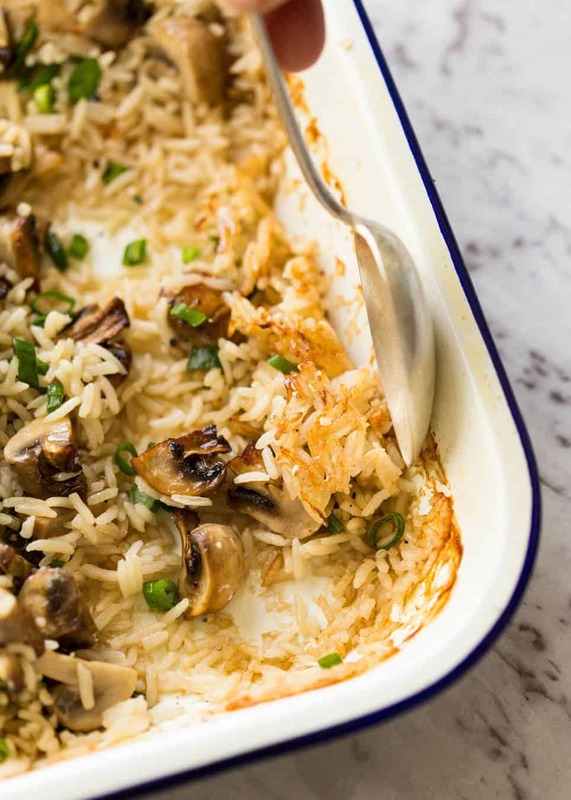 Quick ‘n easy BAKED Mushroom Rice! 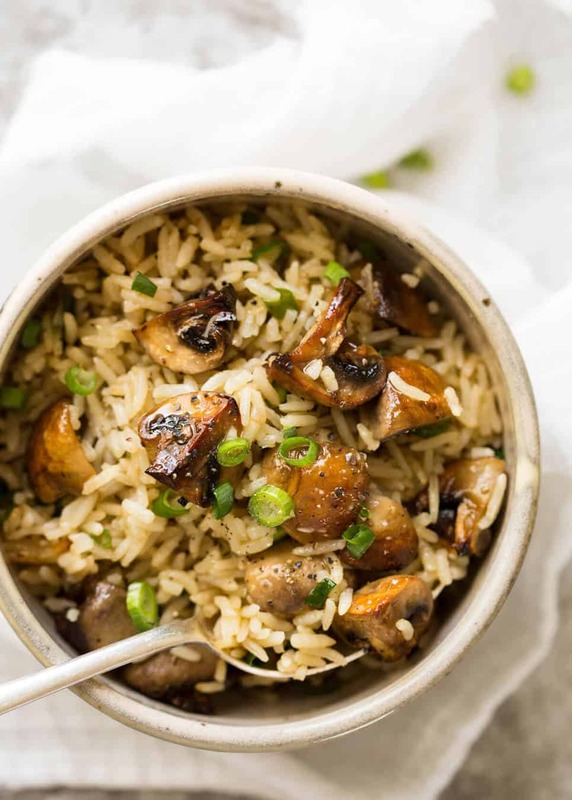 It’s buttery, garlicky, with golden brown juicy mushrooms and the rice is beautifully fluffy. 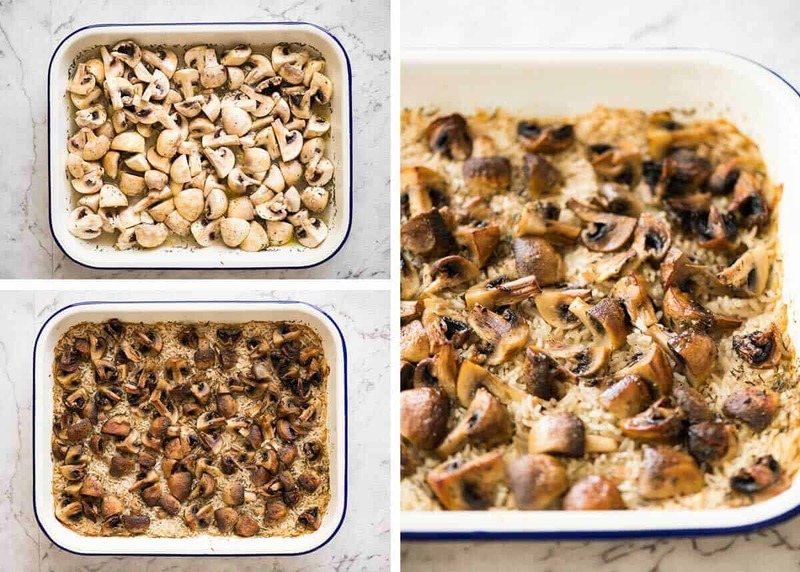 Baked in one pan, the idea behind this recipe is that the gorgeous mushroom juice drips into the rice as it bakes – the best broth base ever! I always assume messages submitted through websites end up being swallowed by some dark anonymous hole. I never hold out much hope of hearing from anyone. I never wanted to be one of those websites because it annoys me when I’m on the receiving end. I made myself a promise when I started out that I would respond to every email I received, and every comment left on my blog. Because if someone takes the time to leave a message, I think it’s the least I can do to acknowledge it and respond in kind. And I really have tried to be diligent keeping this promise. The odd message might slip through, but I set time aside every day to respond to messages and especially to recipe questions. So to anyone who took the time to send me a message and never heard back – I’m sorry!!! I’m scouring my Junk Folder to fish them out and on the case to fix this problem! Now – foodie talk. Let’s talk BAKED Mushroom Rice. 2. Can this be made in the oven? A month or so ago, I shared a Mushroom Rice cooked on the stove top. It’s really fantastic, if I do say so myself. And quite a number of readers, especially on Facebook (err, the Mushroom Rice video has been watched over 14 million times!!! ), asked if it could be baked. Ordinarily I do not succumb to publishing a baked version of a recipe I usually make on the stove so soon after sharing the original. If I cook something on the stove, there’s usually a reason for it! However, on this occasion, I thought that it might bring something else to the recipe – being the mushroom juices dripping into the rice as it bakes. I also thought it might be quite neat to use the technique I use in my Baked Vegetables and Rice to cover the top of the rice with the mushrooms, effectively using it like a lid. And well, well, well, what do you know? It worked a treat! It did take a couple of goes to figure out things like the right amount of mushrooms. Too much mushrooms = too squished to go golden brown, too little = dried out rice. Quartered mushrooms work way better than sliced (cooks too quickly). As for which one I prefer – stove top or baked? I think there is a place for both versions in this world. When time permits, I would probably still go for the stove top because I do think the rice gets a bit more flavour from the browning of mushrooms in the butter. And I just love how the rice gets stained dark brown. But it does take more time to make. Constant stirring on the stove, an enormous pile of mushrooms cooked in 2 batches. So from a practical perspective, I see myself making the Baked Mushroom Rice more frequently on a day to day basis. I am big on rice for a side dish. I know regular readers are probably sick of me saying this, so this is for the benefit of new readers / first timers who happen across this recipe – being of Japanese background, I was raised a rice snob. Mushy rice is a crime in my family. I like my rice tender but not super soft which actually means it is overcooked. Fluffy rather than mushy. That’s what this recipe yields. 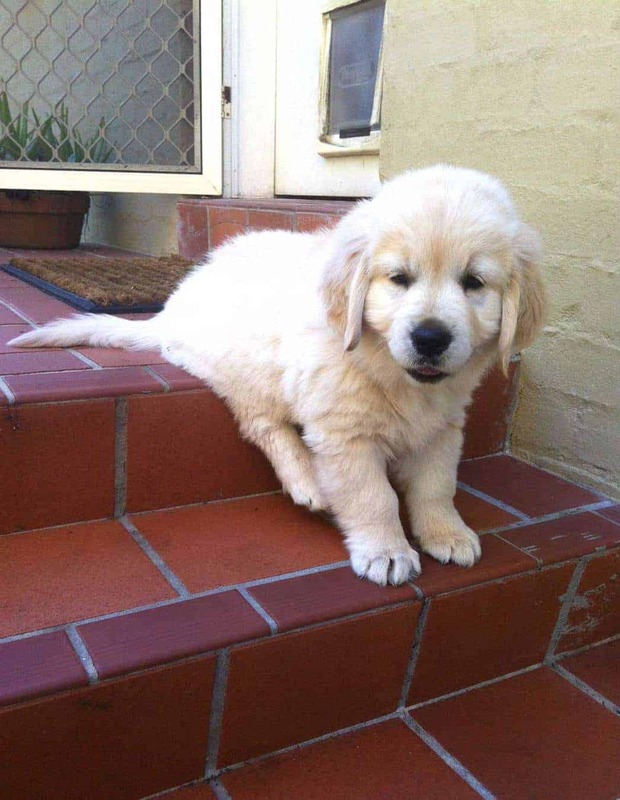 Fluffy rice. 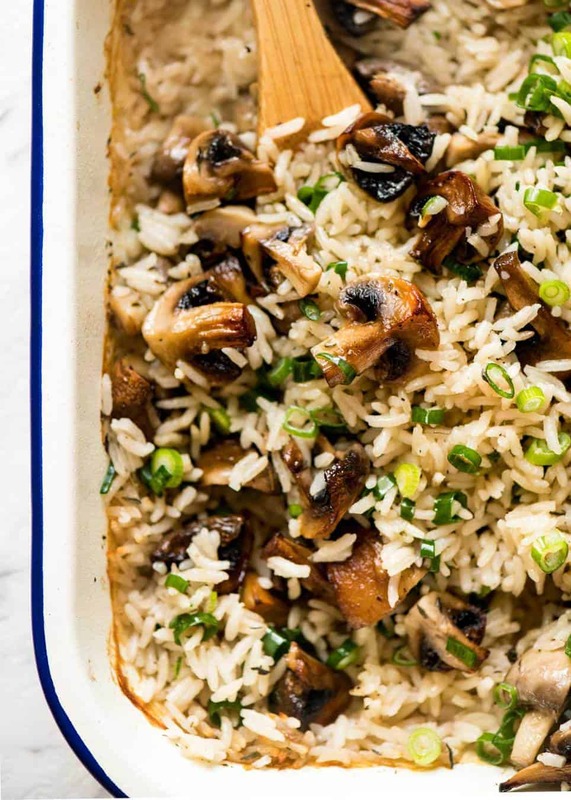 The oven baked version of the wildly popular Mushroom Rice! 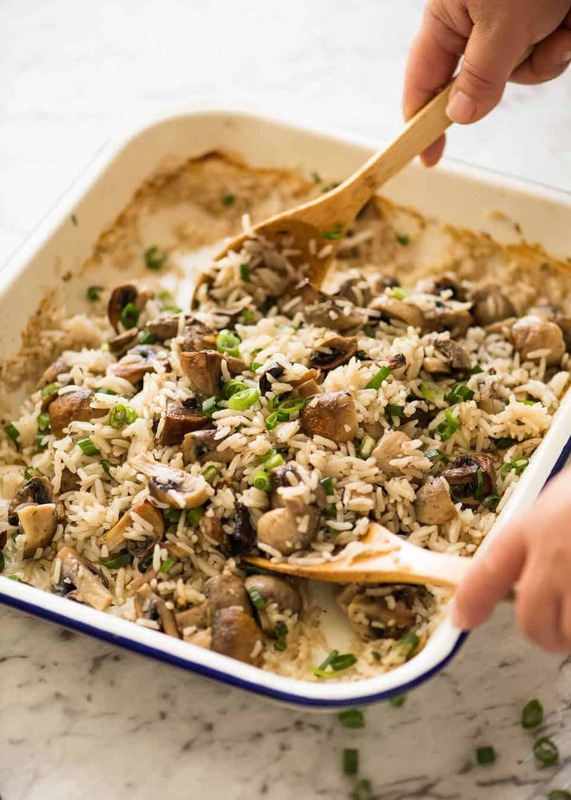 The idea behind this recipe is that the mushrooms act as a "lid" over the rice as it bakes, and the mushroom juices drip into the rice - best broth ever! 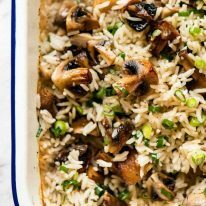 The rice is FLUFFY, garlicky and buttery, and the mushrooms are golden brown and juicy inside. Recipe VIDEO below. Place mushrooms in a large bowl. Pour over hot melted butter, add garlic, salt and pepper. Toss well. Place all the Rice ingredients in a baking pan - 22 x 33 cm / 9 x 13". Mine is 30 x 24 cm / 12 x 9.5" - don't need to be exact here, but don't stray too much from pan size. Mix and shake the pan to spread the rice out evenly. Spread the mushrooms over the rice - they will be partially submerged but should pretty much cover the whole surface area (to be the "lid" while the rice cooks). Bake for 35 - 40 minutes or until mushroom is golden. Remove from oven and rest for 5 minutes. Finishes: Add extra butter (if using) and scallions. Toss through rice. Serve! 1. Perfect quantity of mushrooms is when they cover the surface area in a single layer. That way, they will act as a "lid" for the rice as it cooks, then as the mushroom shrinks it allows most of it to brown (the part touching the rice doesn't brown). If you have large mushrooms, about the size of a golf ball, you can use up to 750g / 1.5 lb because there will be less mushrooms (by quantity, not weight) so less covering the surface. 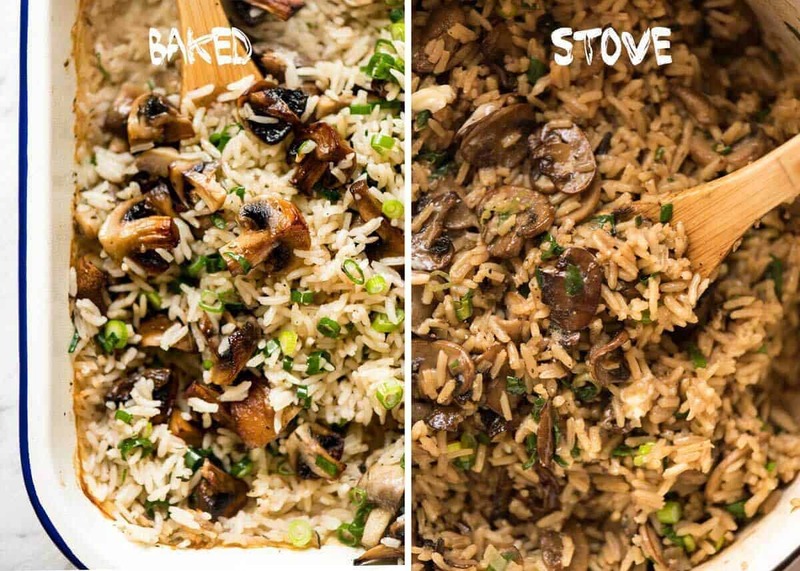 If the mushrooms are piled up too high, they won't brown as much and also the rice will be on the soft side because less liquid will evaporate from the rice as it cooks (because of the mushrooms covering the surface area). 2. RICE TYPE: This recipe is best made with long grain rice because it's less sticky than short and medium grain. Basmati and jasmine will also work - around the same cook time. Medium and short grain rice will work but the rice will be a bit stickier (because that's how short grain rice is). Risotto and paella rice is not suitable. 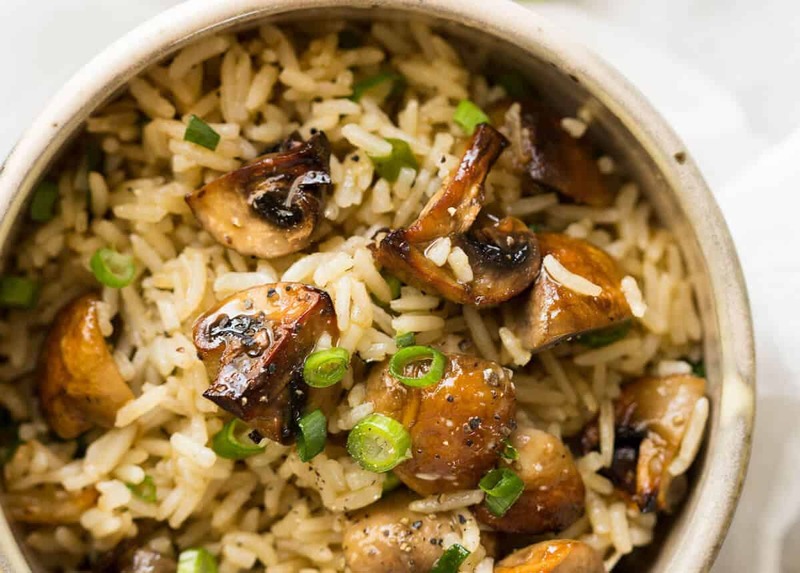 For BROWN RICE, do not top with mushrooms at the beginning. Cover with foil, bake for 30 minutes. Then remove foil, top with mushrooms and bake uncovered 30 - 35 minutes until mushroom is golden. I haven't tried this recipe with quinoa or cauliflower rice. 3. SERVINGS: Serves 6 to 8 as a side. 4. 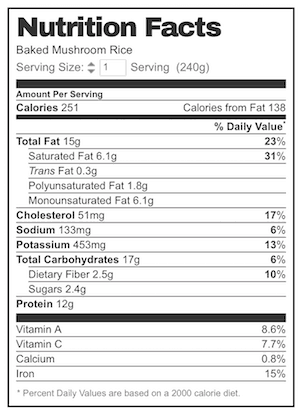 Nutrition per serving, excluding the extra butter. Baked Mushroom rice recipe video! I must confess I had to shoot this in two sessions so you may notice the mushrooms look a little different in some of the clips!! Are you making this with regular long grain rice or with Instant long grain rice? My guess is the regular but thought I better ask. This looks amazing!!! What adjustments can be made for wild rice? Cant wait to try this! I saw those but figured if didn’t hurt to ask! One more question – have you tried it in an Instant Pot? Wahoo Christine!! So glad it was a hit! I am planning to prepare this dish for a cooking class I’m teaching. It’s for 24 people. Is it easy to quadruple the recipe for that sized crowd? Unfortunately this rice didn’t turn out for me. Was somehow crunchy and mushy at the same time. I double checked and followed the recipe exactly using long grain white rice. After 40 mins, I removed the rice and let it rest. When I tossed it after 5 minutes. I saw that it actually wasn’t done at all and was a liquidy mess and rice was still crunchy. I tried to put it back in the oven, but I had already tossed it at that point, so there was really nothing to be done. Your chicken and rice bake recipe works 100% perfectly for me, so I will probably go back and compare the recipes and make sure to do it more like the chicken recipe. Flavor was great though, so I still have hope! I’ve made this a few times now and I absolutely love it, this time round I added some soft feta when serving and it gave it an extra burst of flavour. Thank you for all that you do, I truly enjoy all your recipes. This has become a family favourite, there are never any leftovers. I often top the rice with (boneless) chicken thighs along with the mushrooms. Comes out great, and bonus of a one pan dinner. Fabulous Laura! I’m so glad the family loves it! I always read your notes carefully…usually looking for tips on freezing and then reheating your casseroles. Mainly so I can prepare ahead of holiday meals. … Especially when dairy products are in the recipe. Please add these advisory notes ! I love all your recipes and precise instructions. BASICALLY YOU ARE AWESOME. Thank you. Gave this a try today, and everyone really enjoyed it. Plus, it’ll be easy to convert to a vegan version for my sister! I tried both this recipe and the original one last weekend. They were both delicious, but I was a little heavy-handed (accidentally) with the garlic powder in the rice for this one and we had sa sgnificant amount left over. Yesterday was chilly and raining and was a busy one, so we diced the meat of a rotisserie chicken, sauteed some carrots and celry, combined that with the left over rice, and added chicken broth. THE SOUP WAS PHENOMENAL with that WONDERFUL MUSHROOM FLAVOR!! !